MAY NOURISH BEAUTY BOX. - CRUELTY-FREE BECKY. I very kindly got sent this vegan subscription box to give a whirl. If you haven't seen April's unboxing, you can watch here. Let me tell you, the month of May brought some goodies! So what's the dealio? 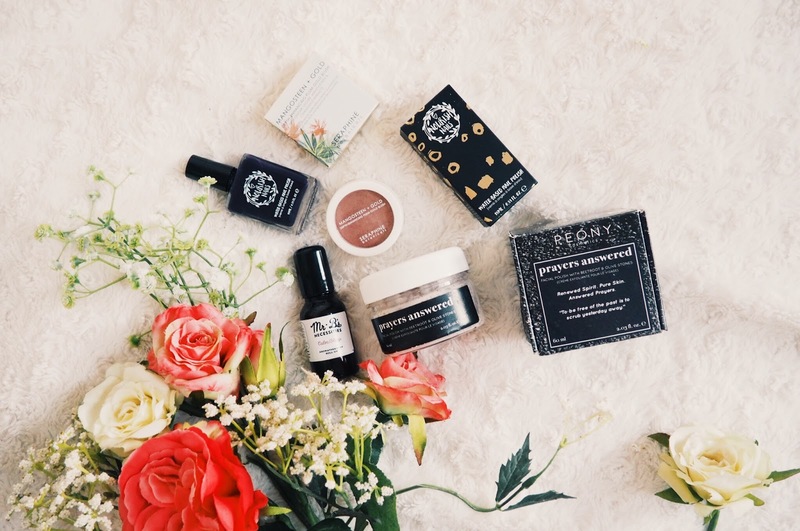 Well my friend, this cruelty-free, vegan & natural beauty subscription box comes with four products each month. 3 are from the same brands each time, and then the last product is a different brand to try. Winner. All products are full sized and this month retail at a total value of $83.45 - not bad considering it costs $36.95 each month. First up is this Mr B Necessities Calm/Sleep Roll On. This has been an absolute God-send during exam season, where I leave most things to the last minute and therefore experience major self-induced stress. I apply this before bed as well as before and during exams, simply by keeping it in my pocket and rolling it on my temples and wrists when I feel waves of anxiousness. The lavender in it soothes bad nerves. Next in the box was a Nourish Nails Polish in the shade Live In The Moment which retails for $12.50. I popped this on my nails right after taking the picture (see one coat applied *messily* below). It's such a beautiful colour and I really love this dark, inky navy shade. The formula is the same as the green shade from the same brand we recieved last week. It requires a top coat otherwise it'll chip, but it's very opaque and I love that it's water-based and formulated without any of the nasty ingredients most nail varnishes have in them. The only issue I have with this polish is that you need to very very firmly seal the bottle otherwise product will build up and dry around the handle, making it hard to open - but this doesn't take away from its function as a polish. The Seraphine Botanicals Mangosteen & Gold Blush that we recieved retails for $14.00 and it's a beautiful mauve-plum shade. Something that I usually shy away from, I was surprised by how much I love and have used this blush. It is very pigmented so you need to go in with a light hand, but the effect it gives is beautiful and the finish is lovely and natural - see it applied to the cheeks below (please ignore my cringey *looking into the top left corner* pose). I am a big (unexpected) fan of this product. The Peony Cosmetics Prayers Answers Facial Polish has a beautifully natural creamy olive scent. The scrub particles in this polish are pretty big, as it contains crushed olive stones, so I only use it on my nose to exfoliate to avoid aggravating my skin. It leaves the skin surface wonderfully moisturisered and refreshed - I adore this as a lip scrub! Very lovely and the most expensive item in the box, retailing for a whopping $45.00. What a steal considering the box is $36.95 altogether. My favourite product this month is probably the Calming Roll On because it has really helped me out with nerves, but I am very impressed with all four products. Do you get Nourish Beauty monthly? What was your favourite product in the box this month? For more details about the box and products inside, see their website here. If you have any cruelty-free and natural favourites or regular subscription boxes then do let me know! I'm always up from trying new things. Try something new everyday my Nan always says. Good motto. They are explicitly accepted to have an assortment of constructive qualities, regardless of whether not in plain view, and constructive identity attributes. Utilitarian Keratin is involved a couple of keratin proteins that were found to be as one in nature just in the fleece of an assortment of sheep that is just found in New Zealand.jolie face cream It is in New Zealand that the best cream for wrinkles is being made.